Cheesy Caprese Chicken Nachos | Easy Chicken Breasts Dinner Recipe! 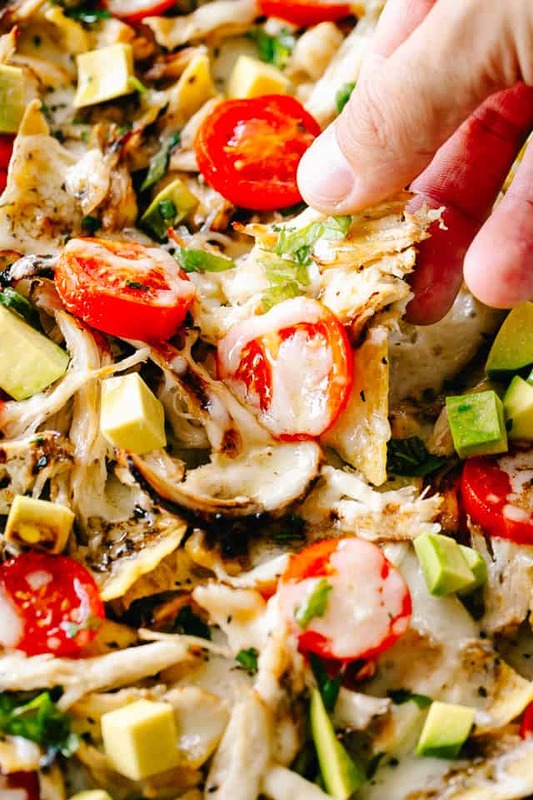 Caprese Chicken Nachos– Easy, super cheesy, and amazingly delicious Caprese Chicken Nachos loaded with mozzarella cheese, shredded balsamic chicken, sweet tomatoes, and fresh basil. 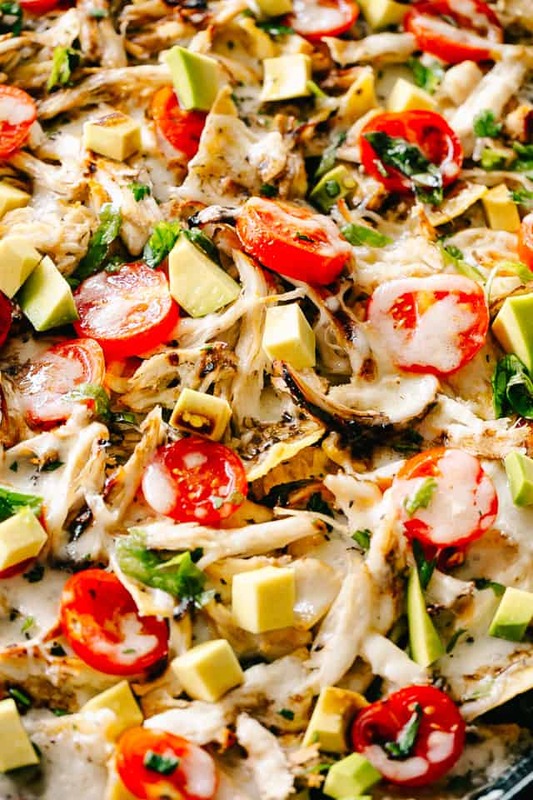 Take your nachos to a whole new level this football season with our awesome Caprese Chicken Nachos recipe. It’s your favorite cheesy Mexican dish, Italianized! Is that even a word? Not into Italian nachos? 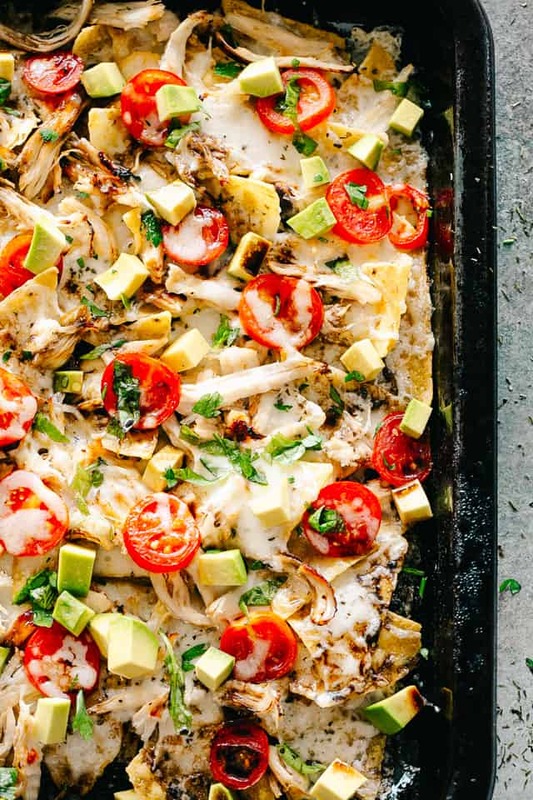 Get my recipe for Sheet Pan Lime Chicken Nachos. If I was you, I’d try these caprese nachos, too. They are so dang delish. What I’m trying to say is; this is what happens when a caprese salad and nachos decide to have a baby. AND, balsamic chicken was its third wheel. This Caprese Chicken Nachos was my contribution to the party for the Bears and Packers game couple of weeks ago. I hate the way that game ended, buuuut, my nachos were the first to go. I don’t think they survived the first 10 minutes of the game. THAT, to me, is a winning dish. I don’t consider myself a huge football fan, but I do consider myself a huge football-party-goer because I go to football parties only for the food. And the winning atmosphere. 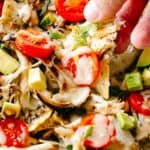 Caprese Chicken Nachos is a recipe that involves tortilla chips loaded with a layer of cheese, balsamic chicken, juicy tomatoes, a bit more cheese, some diced avocados, basil, and a balsamic glaze to wrap it all up. We will first start with our chicken breasts and marinate them in balsamic vinegar with garlic. 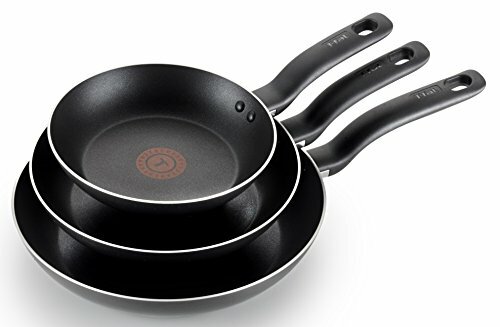 Then, we are going to cook the chicken in a skillet until done. Shred and set aside. For the next step, you’ll want to get out a sheet pan and layer some tortilla chips over it. Add shredded mozzarella cheese over the tortillas and a layer of previously prepared chicken. Arrange halved cherry tomatoes over everything and sprinkle with more shredded cheese. Bake in the oven until everything is heated through and cheese is completely melted. Garnish with diced avocado, basil, and a drizzle of balsamic glaze, right before serving. This delicious and easy recipe is sure to be a big hit! It’s also hearty enough for a meal, and this recipe can be modified to your own taste, using different cheeses and toppings. Prepare the recipe right up to the point before baking. Make sure the chicken is completely cooled before adding it to the pan on top of the tortilla chips and cheese. Cover with plastic wrap and set in the refrigerator until the next day. Let stand 10 minutes on the counter before transferring it to the oven. 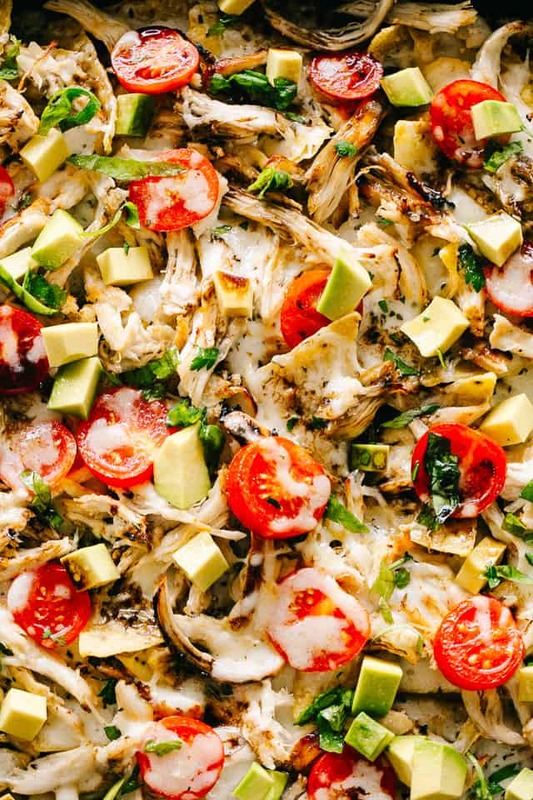 Easy, super cheesy, and amazingly delicious Caprese Chicken Nachos loaded with mozzarella cheese, shredded balsamic chicken, sweet tomatoes, and fresh basil. Combine 1 tablespoon olive oil, balsamic vinegar, minced garlic, dried basil, salt, and pepper in a small mixing bowl. Put the chicken breasts in a zip top bag and pour the marinade over the top; close and place in the fridge for 15 minutes, and up to 8 hours. 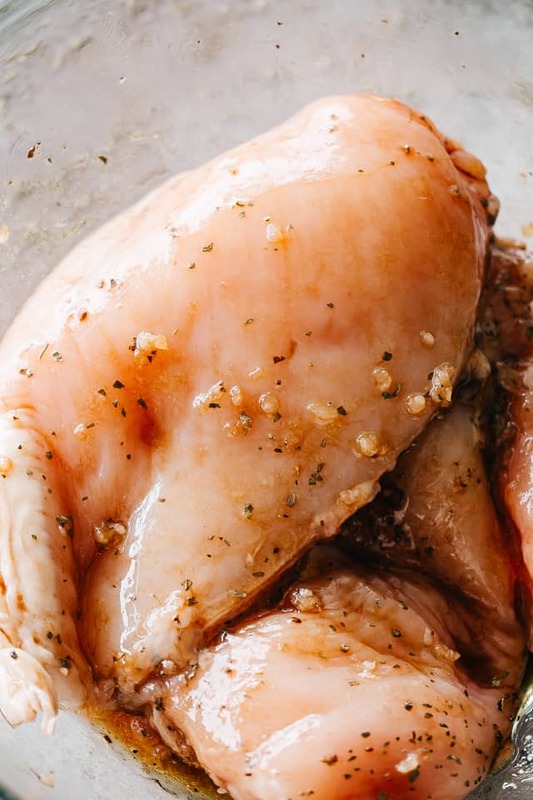 When ready to cook, remove chicken breasts from the bag and discard the marinade. Add chicken breasts and cook for 6 minutes, or until golden brown. Flip and continue to cook for 5 to 7 more minutes, or until done. Remove from skillet and let rest 5 minutes; shred. 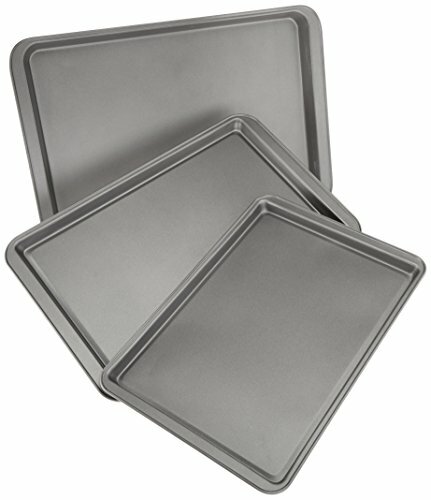 Grease a sheet pan or baking sheet with cooking spray. 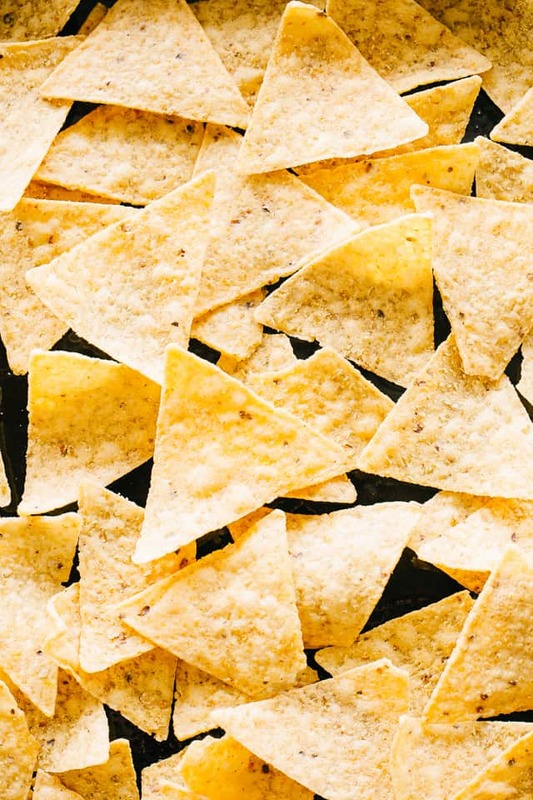 Layer tortilla chips in the bottom of the sheet pan. Sprinkle 1 cup mozzarella cheese over the chips. 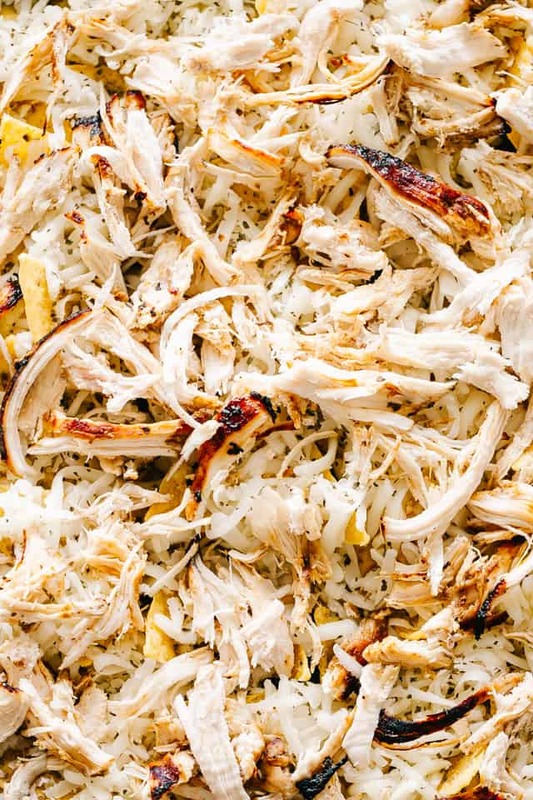 Arrange shredded chicken over the cheese. Top with halved tomatoes and the rest of the cheese. Bake for 15 minutes, or until cheese is melted and everything is heated through. Garnish with diced avocado, basil, and a drizzle of balsamic glaze. These chicken recipes are on my must-make list! This looks like the perfect meal for my family! So delish! OH these I would have much less guilty over-indulging in. YUM. mmm what a great idea. I want to try it immediately! Looks very tasty! This is perfect for Friday night cocktails with the neighbors! I love that its got so many great flavors that I love in it especially all that deliciously flavored chicken with the melty cheese. Its such a nice twist on boring old chips and cheese nachos! Cheers!